I found it pretty easy to set them up – plop on the seat, adjust, away you go! In the pic above you can see great clearance under the seat as a result of the extra couple of inches rearward alignment. There really is no dramatic problem when you let them slide forward, but as borrowed bags, I didn’t want to risk damaging them. Unfortunately the paint on this particular bike wasn’t up to being rubbed against the Banana Bags for several days (as the suspension travelled, the rear stays moved up and down against the bags) and both sides of the frame suffered instead. Oh well! The pair pictured here are medium size, 55L. 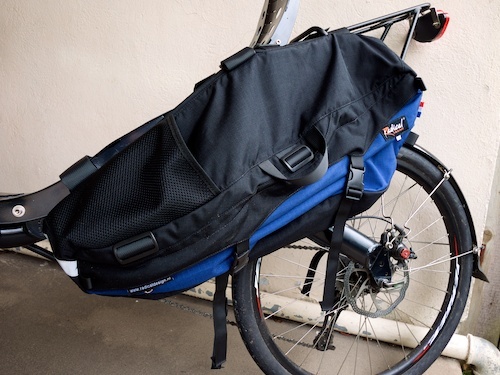 This compares well with rear panniers (such as the classic Ortlieb back roller), most of which are in the 40-45L range. You can go bigger or smaller – Radical offer bags at 10L (Solo Racer) 25L (Banana Racer), 40L (Small Banana) and 70L (Side Pannier large). One thing I will say is that the notional capacity is perhaps not so easy to access as in a pair of traditional panniers – because the bags don’t have an internal frame, I found myself using them a little bit like a giant stuff sack, then having to redistribute stuff to close the zips! 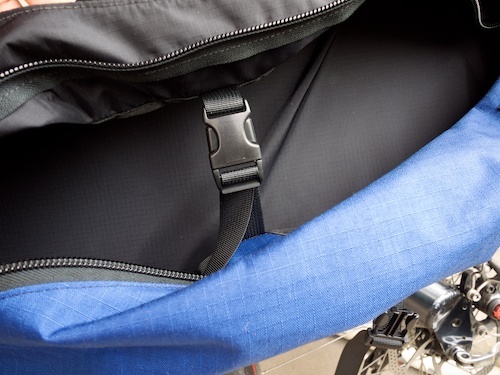 The top surface of each bag has a mesh pocket on the leading edge – big enough to take spare layers, a thin waterproof, or bike bottles (not all together!). This is easy to access while riding and I used them to hold water, gloves, hats, and snacks very usefully. There are also a variety of small loops, perfect for the attachment of odds and ends externally (camera bags etc). The main section is accessed by a long zip, which sits under a very ample storm flap, all cinched down by a pair of sturdy compression straps. See it all done up in the photo below. At the end of the day, the price at around 200EUR (£165 / $260 at time of writing) is steep compared with regular panniers but not outrageous. In this respect the small bags suffer a bit, as 200 Eurobucks for the 25L Racers is a lot more than an equivalent size seat or saddle bag, while 200 Eurobucks for the 70L side panniers (yes, really) seems like quite a good deal! While Radical’s bags aren’t cheap by any means, they are pretty sweet. 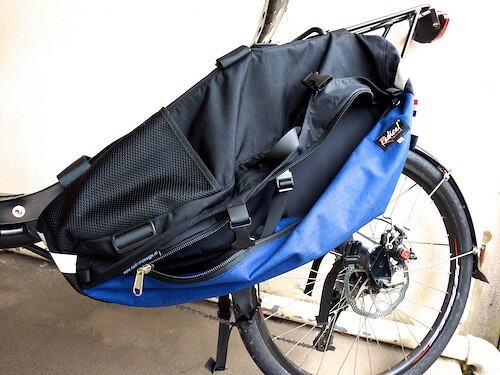 The Banana Racer, for instance, offers the same 25L volume of a Carradice Camper Longflap saddle bag, but at half the weight (less than half the weight if you consider a bag support to be necessary to ride with a saddle bag), the Solo Racer likewise versus the Carradice Barley. For most purposes there’s no meaningful aero penalty – on my Easter tour, I had to freewheel into the wind to let upright tourers behind me stay on my wheel. The Banana Racers are competing more with a back-box or tail bag, and in this respect may not offer such a clear advantage. They look to be slim enough to sit behind the shoulders, but I haven’t seen a pair in real life to know for sure. 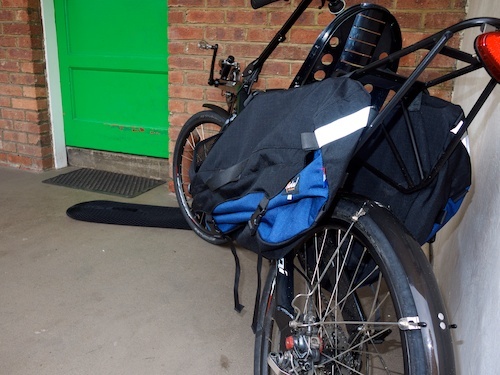 The image on the right shows a traditional pannier (grey) mounted behind the Banana Bag on a Challenge Furai. 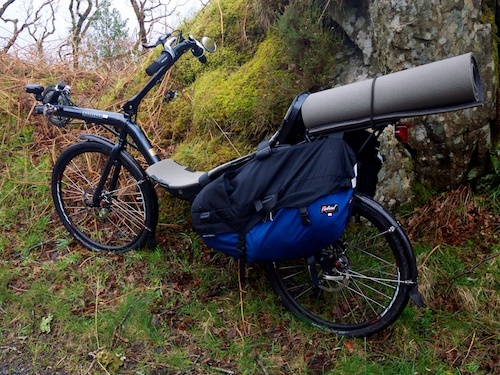 The cross-section into the wind is over 2x larger, yet the pannier is much smaller (40L vs 55L per pair). 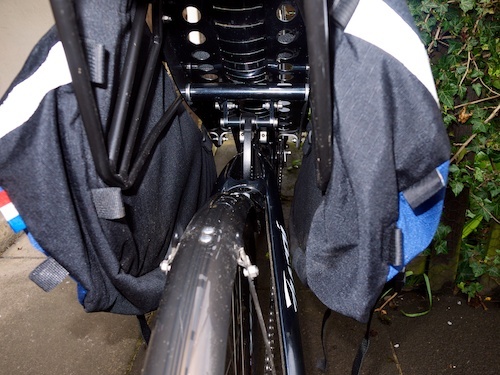 You also don’t need to worry about the weight limit of your rack, because the bags are supported almost entirely by the seat (although if you’ve got personal weight issues, you may have to worry about the seat!). The Challenge day rack, for instance, has a 12kg limit and although that’s quite a lot of stuff, I’d be worried about exceeding it on anything longer than a weekend. I spent three days in solid wet misery with the Radical Banana bags! Not all of my stuff was in dry bags inside them. For a non-waterproof bag, I was impressed that very little moisture penetrated, but you’d be in for a shock if you entrusted something like a down sleeping bag to them alone, because after 8-10 hours of rain, there was certainly moisture (not pooling fluid however) on the inside. They don’t come with waterproof covers and on a short ride I wouldn’t worry about rain finding its way inside at all, but for touring use, a liner bag has to be recommended. Weren’t the smallest ones (2×12,5l) like 100-120 euros just till recently ? I remember that it was the same, or similar price as the Solo Aero. That inner strap is for taking weight off the zip closure, especially when closing them. Works great when they’re really full when on holiday. I use mine for more than 10 years now, every summer holiday. Still in very fine condition. Sturdy stuff, well worth the money if you really use them. But, yeah, put a plastic bag around your clothes and books or buy a liner. Hey Reinout – thanks for the comment. That makes a lot of sense, and it’s good to hear a long-term review of the bags! underseat racks for pannier attachment for the Metabike. The ‘bent I chose was/is a Metabike and it’s paid for and waiting for me to pick up. I’m looking forward to attaching the RD’s to it. I will say the Banana M’s have scant webbing. 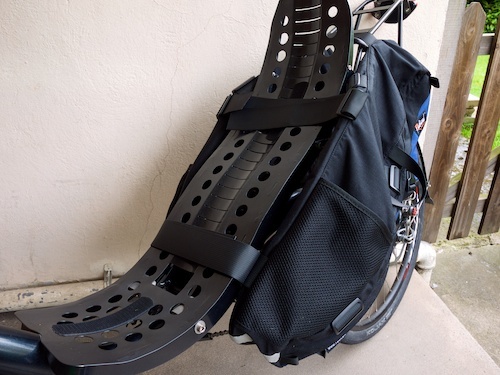 At first I wondered how you actually attach and in my case the rear rack (a Hebie 120II) is lower than your’s pictured in this blog-but I see no issues with affixing one to the other. That said weight might become an issue. I weigh 182 pounds (82.7kg) and the carbon seat from Metabike has a 200 pound (90.9kg) weight limit. 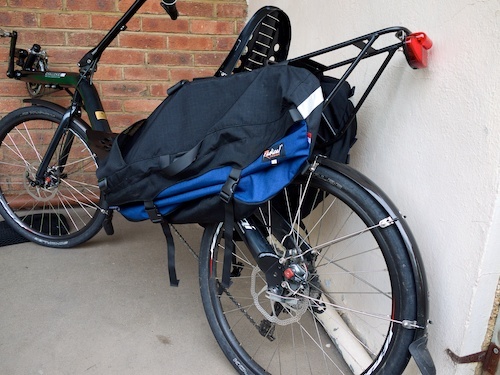 That gives me 18 pounds of kit limit between each pannier BUT it is my hope that I can attach in some way the panniers to the rear rack so a portion (hopefully significant) of the panneir load can be carried by the rear rack and not the seat. Thank you again for an excellent review/pics/useage judgement! I was able to pull the bags back so that the rearmost strap laid on the Furai rack, and I experimented with a mini-bungee to help secure them. Definitely a good option although being a seat-mounted rack that wouldn’t help you directly. HA! I will report back, but have to learn to ride the ‘bent first! As always a good review! I have the radical sidepods which were branded “Trice” (which I bought with my Trice Q five years ago) and they’re still working really well and are still showerproof. They’re a bit smaller than I’d like sometimes so I’m considering the Banana Bags L although Radical’s website suggests there might be issues with 20″ wheels. I shall have to investigate further. I like the sidepods as I tend to find I get some creaking from my ICE Sprint rack with heavy panniers on it whereas in the sidepods all seems quieter and more aerodynamic. Thanks for your feedback. These are great bags all round, and it should be possible to find out whether they will work for you. I’m pretty sure there are size L bags at Laid-Back-Bikes which could be put over a trike to check for wheel / ground clearance. Please remind me if I don’t update you!